You're about to start the trip of a lifetime, so of course you'd also like to document it. There are so many ways to do this and we have some thoughts for you to narrow down what you want from starting a travel blog - or any other blog for that matter - maybe a new option for the future! Do you want to just let friends and family see your trip? Would you like a blog/website to showcase to others how you travelled Australia and recommend your spots along the way? Would you love to do all of the above and.... make a bit of money on the side too? Affiliate links are a great way to do this and we do this too. If you love a product and would recommend it happily to others, then, why wouldn't you make a little money from that recommendation?! OR would you like to take things to the next level and take the opportunity to go in a different direction and set up a new business? Click on any of the above to go directly to that particular section or read through them all, you might start off thinking just friends and family...but who doesn't want to make a bit of money as they go? Oh and one of the great programs that we use to edit our photos is Pic Monkey (I needed something super easy, super versatile and it also has super support!). A Blog for Friends and Family to see. Some people just stick to a Facebook Page or Group to blog about their travels, it's simple, not too much of a commitment and keeps everyone in the loop. A page means that anyone can find it but you can invite your loved ones specifically and anyone can see it. With a Facebook Group you can make it private and invite family and friends yourself. You can also run a Facebook group and make it public where people can ask to join, but this does not really fit in with the above idea for just friends and family. This is what many TAWKers do and there are many, many, many systems out there to do this (overwhelmingly so). We won't go into all of them there as you could Google that yourself. We will guide you on what we know and like and think you will. This is a great way to showcase your travels to not only your friends and family, but a chance to show them to other TAWKers too. Let's face it it's always better to find out what somewhere is like from people that have been. So this is an option that many choose when starting a travel blog. It's also really cool to get a name that suits your blog. If you choose to go with some blogging platforms, the name comes free with it, ie: www.madeuphosting/travellingaustraliawithkids (I made this up of course). The issue here is that whilst it is free, it's not really under your control. (Wordpress.com do this too, so it is tempting - but it is also restrictive - especially if turns out you are a natural and down the line you might want to monetise your site too). So not something that is ideal as your situation may change as opportunities arise along the way. Also with some of them, (and this happened to me!) if the company goes down, so does your site - I just found this with our travel blog site that we had with Travel Pod. They took the whole platform down and I had to download all my blog posts. So I wouldn't really recommend that way anymore. (I am gradually making it a part of this blog...but it's taking a while!). I like this part! Getting your own blog name - called a 'Domain Name' - (you may have to pay - but you may not, if you choose the hosting along with it - see further down). It needs to be unique and obviously unique to you. You can check to see if the name you might like to call your blog/website is available here. You just pop in the name you have thought of and you see if it is available. If it is, you register it to you asap to ensure no one else grabs it. BUT first as I say, you might just be able to get this for Free if you sign up to host at the same time. I can personally say that their customer support is second to none and you can do that whole 'Chat now' thing where a little window opens and you can 'write/type/chat' to each other OR you can of course call and chat to a real person! Haha! Seriously though I've found them to be great support, not only in a customer service way, but in a how to get your website up and running kinda way too! This one comes up a lot and there are quite a few options for you starting a travel blog... BUT again the overwhelming consensus is always Wordpress! A blogging platform is a way to actually put content on the internet. A way to put your words and photos up there. I found it quite tricky at first, but now, a doddle. Plus there are so many tutorials for getting set up that you are guided through each step until it becomes second nature. If you do end up going with our recommendation and SiteGround, they have a really really comprehensive Wordpress for Beginners tutorial. Easy Peasy! Are you interested in also making a bit of $$ while you are travelling? Why wouldn't you be! There are several ways that you can do this and you can search the internet for all the ways, but one of the ways that we love, is in joining Affiliate Programs. The idea is you recommend a service or product and if others click on it and purchase something in a certain number of days, you get a little bit of commission. Up until recently I was only making a few hundred dollars a year. BUT I have recently taken this course and I am starting to see the money come in - it's taken me a while, but hopefully you can get onto it sooner and learn how to do it properly! We stick to the rule of only recommending something that we would anyway if we didn't get paid for it. Obviously, it's your reputation on the line. I learnt how to do MUCH BETTER this by taking an Affiliate Marketing Course online. It was the best money I ever spent and it certainly made me realise that I could be making the most of helping other TAWKers AND making a bit of money for TAWK as well. After all, we have to keep the lights on too! Seriously if you are thinking about earning money through affiliate marketing when starting a travel blog, then take the course. I tried affiliate marketing in the past, and as I say, had a few hundred dollars a year coming in, nothing seemed to work, but now I know I was doing it all wrong. Just putting links on my page and thinking that the $$ would roll in...NOPE! So I took a leap of faith and bought the course. 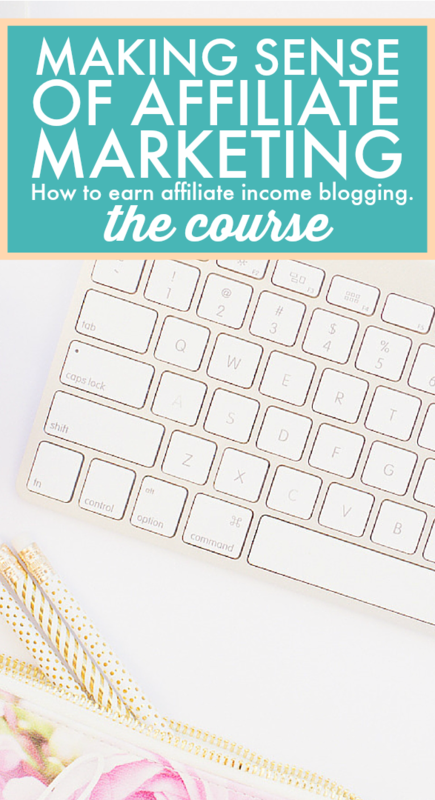 Pretty much spurred on by the fact that Michelle earns over $50,000 a month through affiliate marketing, and she shares all of her best tips in this course! Check out Making Sense of Affiliate Marketing TODAY! Yes we are affiliates of course and you could be too! This girl has made a lot of money this way, I want to and I want you to too! :) Starting a travel blog could be more profitable than you realise! It's not easy to get paid to travel and blog about it, however people are doing it, so you could certainly look into this. YTravel Blog have a whole series around it and they are travelling the world! However for most of us, you'd just like to have some money coming in while you travel. So this is what I will talk about. Sometimes you can approach a campsite for promotion of their spot for free accommodation and then you blog about it and how you found it. You can approach a business with a product you like the look of to see if they would be interested in sending it to you to use and then blog about. We now get lots of business approaching us and we will present them to you only if we think they are a good fit, and we also always ask them to give TAWKers a discount too! You could look at Google Ads..but to be honest, it really does not pay much at all - or it hasn't for us so far. A really good thing to think about, is not necessarily starting a travel blog, but another type of blog that you do know something about and getting an ebook up and running, so you would sell your own products. Ie If you like keeping tropical fish in you 'normal world' well maybe with some time out from this you could consider taking this route. The segment below can walk you through a new on-line business and SBI that I talk about below, can also help you decide what to blog about! Wanna make some $$ with a New On-line Business? Another thing you could consider when you are TAWKing, rather than starting a travel blog, is to start an online business. It's actually easier than it sounds and hopefully you will have some time on the road to think about your passion and how you can turn it into an online business. Let's face it, if you are doing something that you love, it could almost be a hobby-business. This is how it happened for me and how this blog / home business is helping me to keep my sanity now that I am no longer travelling and gets me a bit of an income too. I always say 'work your hobby', so thought I'd better practice what I preached! An all-in-1 package of step-by-step process, (which I needed at the time!) software tools, comprehensive guidance, 24/7 support and "auto-updating" that gives you everything you need to build profitable online businesses. Then name, the hosting and the platform. This is what I decided to do. Basically I met a school mum who had here own really successful website going, she was being PAID to review family holiday spots all around the world due to her successful website! AND she was using SBI !! So now I host through them, get business ideas through them and use them as the blogging platform for this site. As I say, it includes not only the domain name, but the hosting AND all of the instructions on a Step-By-Step-Basis. Together with an amazing forum of experienced SBIers that know everything. Even the most stupid of things that you're almost embarrassed to ask, someone has already asked it! I felt at home!! And I still do. If you like the Wordpress platform - and everyone seems to! - BUT you still need some business guidance then SBI have an option to join all the support and business ideas without hosting with them. You can also get a FREE trial to see what you think about all the information you could be a part of and learn from. So many ideas, so much experience and a real support system as you start your online journey. Have a little look here as it just might be the guidance that you need to get you started. Well that's about it for now. Hopefully you have more of an idea just how easy starting a travel blog can be and or how you can start your own online business and make some money whilst on the road. Good Luck and most of all...enjoy! !